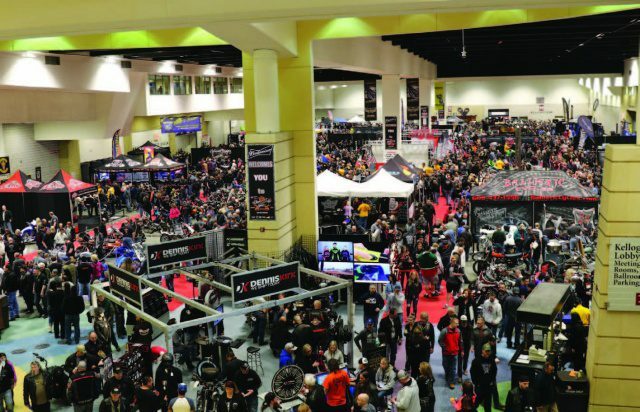 This year’s Donnie Smith Show, located in St. Paul, Minnesota, had all the ingredients for a great weekend; indoor flat track racing, a motorcycle show, car show, and a massive indoor swap meet. 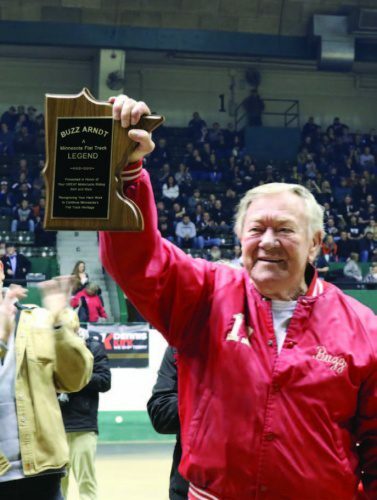 Friday was the inaugural “War of the Twins” indoor flat track races at the Minnesota State Fai rground. This was the first year for the flat track races, and it was a great addition to the Donnie Smith Show weekend of events. There was phenomenal racing, and a few pretty epic crashes. The crowd turnout was huge, which really added to the electric atmosphere. 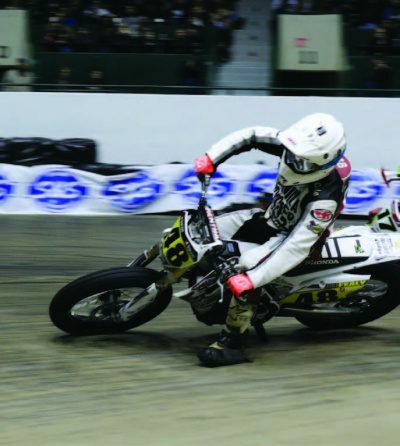 These indoor flat track races are great for spectators because you can get extremely close to the track to watch. Combine the closeup view with the amplified sounds, smells, and excitement of being in a confined an arena watching the motorcycles racers go by makes for a wild time and a great beginning to the weekend. Saturday was the opening day of the Donnie Smith Show, and I knew enough to get to the show early and head straight to the swap meet. This indoor swap meet is enormous, and there are rows and rows of parts. As soon as the doors opened, I went straight to the swap and started scouring the parts for deals and parts I absolutely had to have. I made out pretty good and had quite a loot to carry back to the hotel. I received more than a few looks as I came strolling into the hotel lobby with a cart full of tires, rims, exhaust and other miscellaneous motorcycle parts. 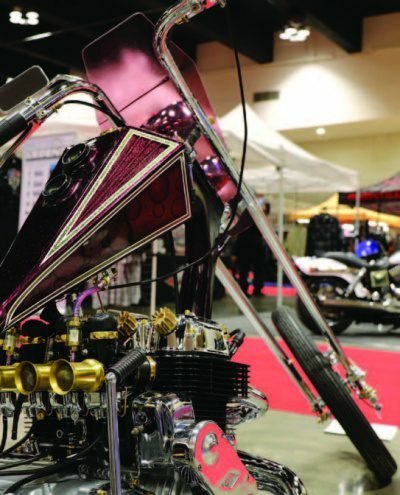 After spending almost every dollar I had on my swap meet shopping spree I headed to the motorcycle show to check out all the custom motorcycles on display. 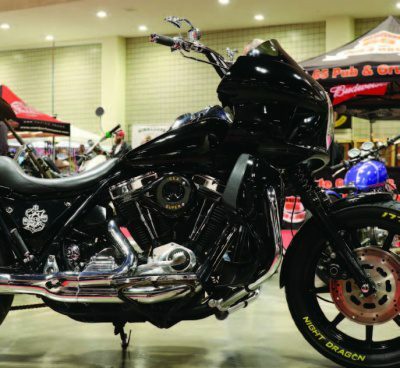 This show always has some incredibly cool bikes that are brought out and this year was no different. 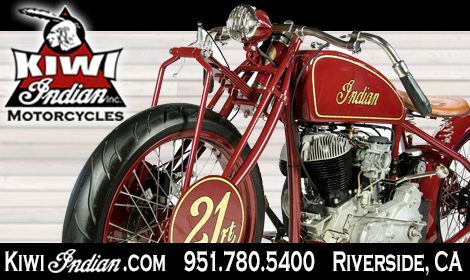 There was a wide range of custom motorcycles from choppers, bobbers, both metric and American, baggers, café racers, and a few builds that defied all category labels. 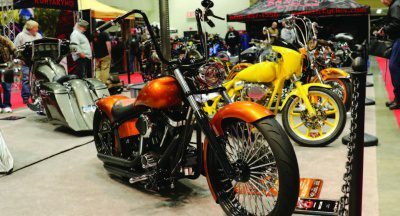 One of the highlights was a bright yellow custom 1985 FXR that had been meticulously restored by the Klock Werks team. 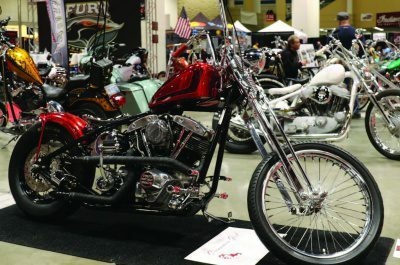 This was a custom FXR that was built by Gene Koch in the late 80’s and was brought back to showroom condition and unveiled at this show. Another highlight from the show was found in the Metzler booth. The legendary Sugar Bear was in attendance and was at the booth signing autographs, taking pictures, and telling stories. It is always so great to see him and listen to a few of his tales. 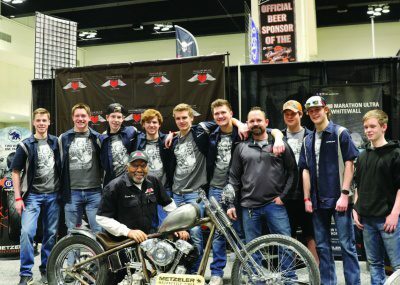 At one point in the day, Kevin “Teach” Baas brought his chopper class from Lakeville North High School to the booth to show off their inprogress build, which uses one of Sugar Bears famous front ends. It was excellent to watch Sugar Bear interacting with the high school students; you could see the inspiration and motivation flowing, sparking these future chopper builders. The best part of the show for me personally was meeting Donnie Smith and having a great conversation with him. 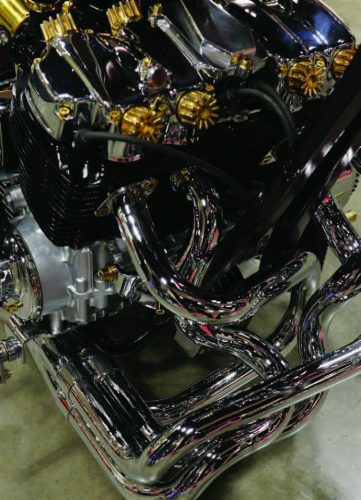 He is one of the founding fathers of custom motorcycles and definitely put the Midwest on the map. 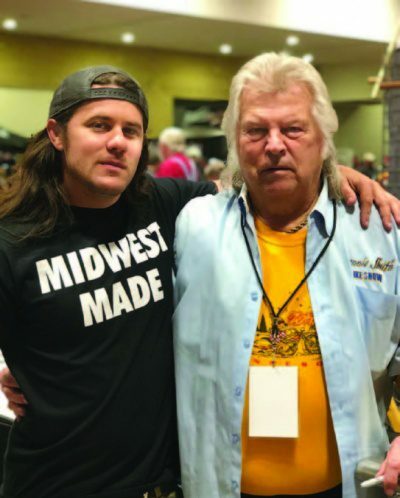 Our discussion covered motorcycles, politics, guns, President Trump, and a story about the first motorcycle frame he cut and raked many years ago back on a farm in rural Minnesota. I was very thankful for our conversation and I walked away motivated and inspired. The Donnie Smith Show is one of my favorite Midwest shows. The show has so much to offer, no matter what you are into and this year’s addition of the flat track races really amplified this show. 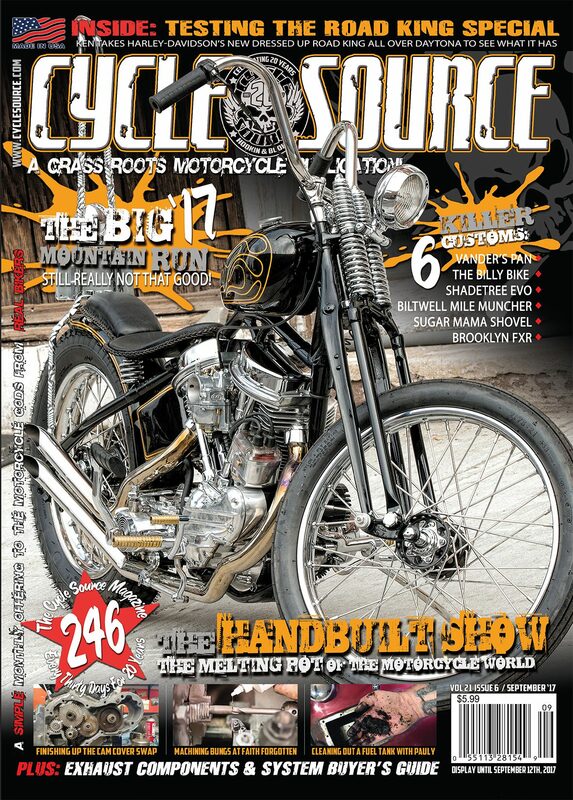 This entry was posted in Shows and tagged Back Issue, Cycle Source, Cycle Source Magazine, Donnie Smith, Donnie Smith Show, Events, Flat Track Racing, racing, Show, Story, War Of The Twins. Bookmark the permalink.